Dampen ribs with Worcestershire Sauce and apply Ridley's Rib Rub liberally on both sides of ribs. Allow to season overnight in refrigerator. Slow cook at 225 degrees for 3 hours, then remove and wrap in foil and cook for another 3 hours. Tip: You can always tell when ribs are fully cooked. The meat will withdraw about 1/4 inch down the tips of the ribs. Cut between each rib and enjoy! Serve with Ridley's Prize BBQ Sauce. 1 Batch of Stuffed Jalapenos - 32 pieces (this is a good appetizer for 4-8 people) "we've been known to make a meal of these"
Cut off jalapeno stems or pull them off. The more of the stem removed the better. Cut the jalapenos in half long ways. Use a spoon to remove seeds from jalapenos. Wear gloves or wash hands immediately. I hold the jalapenos in a dish towel. Jalapeno juice will stay on skin for two days. Wash and dry jalapenos. Cut bacon strips in half, separate on plate or microwave bacon tray. Par cook (half-way) bacon, drain grease, let cool to the side or in frig. Fill each Jap with cream cheese. (at this point you could put in a cooked piece of shrimp, etc) We like them plain. Wrap bacon around jalapeno and then put tooth pick through the middle to hold bacon in place. Make the bacon tight but don't break it. The better you do this the more likely it will stay on during grilling. Cook on the grill (or in oven). Low heat. Top tray. Cook 25-45 minutes as slow as possible till the bacon is cooked. Remove and let cool for a minute or two. Then serve. Press pepper evenly onto steaks. Place steaks on grill. Grill, uncovered 11 to 14 minutes for medium rare to medium doneness, turning once. Meanwhile combine Fresh Tomato Tapenade ingredients in a small bowl. Season steaks with salt, as desired. Top each steak evenly with Fresh Tomato Tapenade. Whisk together all ingredients in stainless steel bowl. Store in refrigerator. Put whole tomatoes and peppers on grill. Cook until skins are blackened (keep turning). Peel blackened skins and remove seeds from pepper. Do this in a bowl so you won't lose any juice from tomatoes and peppers. Set aside. Slice steak and onions into chunks. Skewer 1 slice of steak and 1 piece of onion alternately until skewer is full. Marinate in olive oil, soy sauce, garlic powder, and pepper for several hours or overnight. Cook on grill and serve with tomato and pepper sauce. If desired, add to skewers cherry tomatoes, bell peppers, onions, mushrooms. Sirloin Steak with a Flair! Place onion, garlic, olive oil, vinegar, soy sauce, rosemary, mustard, and salt and pepper into the bowl of the food processor. Process until smooth. Pour over steak in a re-sealable, plastic bag, and refrigerate several hours. Brush grate with oil, and place steak on the prepared grill. Cook for 3 to 7 minutes per side, or to desired doneness. Slice to serve. 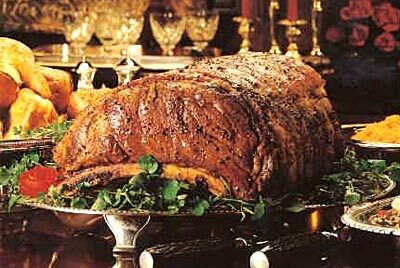 Prime Rib Roast made easy! Wet down roast in Worcestershire Sauce. Insert slivers of sliced garlic cloves throughout the roast. 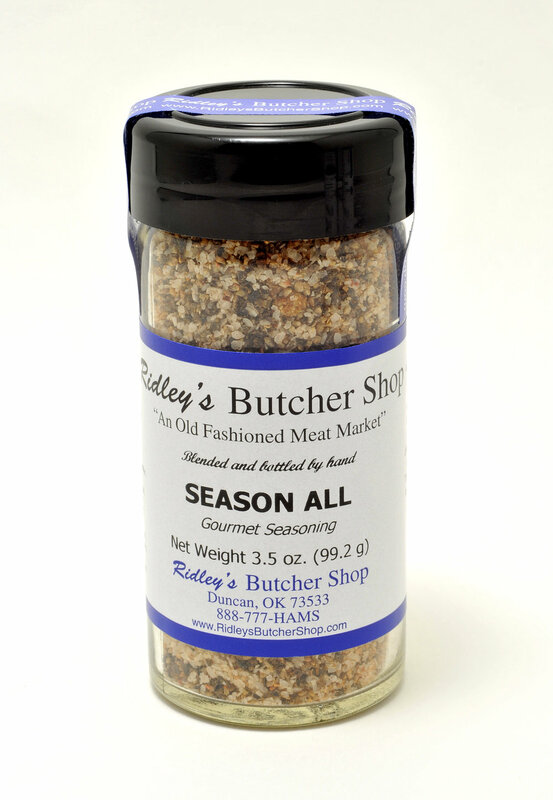 Lightly sprinkle Ridley's Prime Rub on entire roast then generously coat roast in black pepper. Place on rack in roasting pan, covered. Cook at 325 degrees 2.5 - 3 hours checking temperature with a meat thermometer for desired doneness. Interior temperature of roast should be 160 degrees for a rare center and medium done on the ends.